For those who want the experience of snowmobiling Colorado up to the Continental Divide at their own pace. Maps provided. Easy to follow trails. Largest open bowl play area in Grand County. All of our machines are Ski Doo snowmobiles. They are perfect for one or two people, although each machine option varies. You must have at least two snowmobiles in your group to go out. The 2 hour rental option is only available on a walk-in basis. We highly suggest at least 4 hours in order to get out onto the trail system and have some time to enjoy your ride. 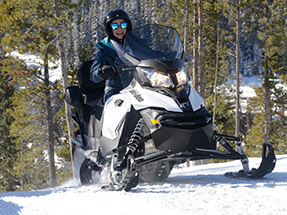 If you want to spend more time riding all the groomed Colorado snowmobiling trails in our area or exploring the vast back country of “un-groomed” trails and meadows, we offer Ski Doo Trail Touring, Ski Doo Renegade Sport (singles only) and Ski Doo Summit 600 2-stroke 155 snowmobiles (singles only). The Sport machines and 600 Summit 2-stroke are subject to a price difference. The Full-Day option is the ideal choice for our Grand Lake location. With a vast terrain system, there is tons to explore. We also offer Multi-Day rentals in Grand Lake in order to give you the time to truly explore all the wonders of Grand Lake, the Snowmobile Capital of Colorado! It is legal to drive your snowmobile around town in Grand Lake, if snow coverage is adequate. Want to ride Grand Lake but hesitant to go without a guide? Give us a call today to inquire about possibly adding a guide to your Grand Lake Adventure. We have very limited availability for this option, and it must be booked in advance. Please note this option is not available during the holidays and other peak periods. Dress in layers. Bring ski wear, gloves, and goggles (required) for eye protection. Also, neck gator, scarves and or face mask are high recommended. Boots and DOT certified helmets are provided. Don’t forget a camera, sunscreen and bottled water. We do have some items for sale on site. You are responsible for any and all damage to your machine while on your trip. We go over the machines with you prior to your departure. Every participant must sign a participant agreement before they go. A legal guardian needs to sign the participant agreement for minors under 18.